The 13th Amendment to the United States Constitution abolished slavery, with one exception. It allowed that slavery was still permitted as punishment for a crime. 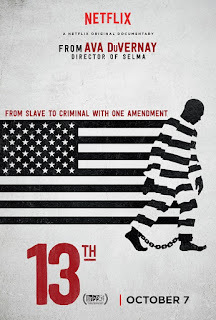 It was in this way, Ava DuVernay's documentary 13TH argues, that the American criminal justice system became a de facto way to continue utilizing black men (and, although the film doesn't really touch on it, other poor people and undesirables of all races) as free labor. "Crimes" like vagrancy and loitering became jailable offenses, allowing for large numbers of black men to be rounded up, incarcerated, and put to hard labor. Modern policies like "three strikes you're out" and "truth in sentencing", combined with the privatization of the prison industry and the use of prisoners as a labor force therein, continue this strategy to the present. In short, 13TH claims, blackness became criminalized. It should disturb all of us that the United States, supposed "Land of the Free", has about 4.4 percent of the world's population, but around 22% of its prisoners. And while blacks make up 13% of America's population in total, they comprise 40% of its prison population. These are facts, but they do not in and of themselves prove the film's thesis. For that, 13TH offers supporting evidence from a procession of talking heads and historical documentation. There's no doubt 13TH has a particular slant. However, when one sees even conservative figures like Newt Gingrich and Grover Norquist alongside the expected civil rights activists and bleeding heart liberals all saying that, yes, the American justice system is stacked against African Americans, it's hard to argue with its basic thesis. It really comes down to matters of degree, and on which side of the system the blame should be assigned. Based on the evidence presented here, there's plenty of blame to go around for Democrat and Republican, conservative and liberal alike. 4 out of 4 stars.